Most of our clientele are women; therefor I thought this was relative and important to our readers. One of our favorite quotes is: in unity there is strength. We need to educate, inform and support each other. I had no idea that there was an International Women’s Day. Apparently it has been observed since the early 1900’s. 1909 to be exact. 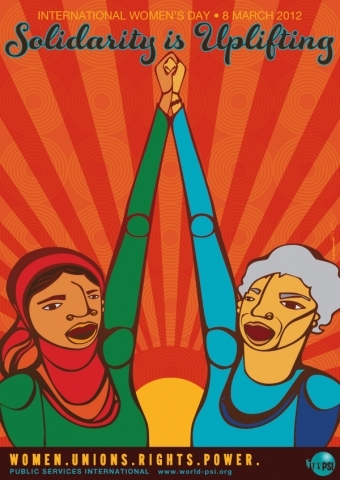 Every year around the world, International Women’s Day marks the economic, political and social achievements of women. How have I missed this? I am embarrassed that I have never even heard of this day when to celebrate is a paramount event for others. In 2007 violence was sparked in Tehran, Iran when a rally to celebrate International Women’s Day was being formed. Hundreds of women and men were beaten by police. Police arrested the women, some were released after several days of solitary confinement and interrogation, others were held longer. Meanwhile I could have celebrated all I wanted here in America but was unknowing. Each year a theme is chosen as a focus. The UN theme for 2012 is Empower Women – End Hunger and Poverty. This year many events are targeting women who live in rural areas and providing opportunities for these women to gain knowledge for ending the starvation and thus disease in their villages. Public health officials are calling on policy makers and global donors to empower rural women by supporting health and wellness programs. This day could serve as a reminder that we not only have a voice here in our country, but using it is the best gift we can give ourselves. As women in America we can express ourselves. Observe a child and you’ll witness the gift of full expression. Sometimes our decisions are out of habit, fear or pure comfort. Reclaim that freedom of voice. Now that I know, you can be sure that I will celebrate. We can all celebrate, in our own way, if only by personally acknowledging the lives of the women around us. Embrace the richness of the moment and know that you and every woman around you deserves to shine and be celebrated! Be gentle on yourself, and hold your head high. This week incorporate self-care in your agenda. Add a few ways to be more resilient and positive. Start small by sitting under the warm sun or having a good cup of tea, stop for a breath of fresh air. We all have beautiful, different, and creative ways to take care of ourselves. Take this day, March 8th, to celebrate women.